Whitby Township (now the Town of Whitby) was named after the seaport town of Whitby, Yorkshire, England. In addition to Whitby, Yorkshire, the Town of Whitby is also officially twinned with Longueuil, Quebec, and Feldkirch, Austria. When the township was originally surveyed in 1792, the surveyor, from the northern part of England, named the townships east of Toronto after towns in northeastern England: York, Scarborough, Pickering, Whitby and Darlington. The original name of "Whitby" is Danish, dating from about 867 AD when the Danes invaded Britain. It is a contraction of "Whitteby," meaning "White Village." The allusion may be to the white lighthouse on the pier at Whitby, Yorkshire, and also at Whitby, Ontario.' Although settlement dates back to 1800, it was not until 1836 that a downtown business centre was established by Whitby's founder Peter Perry. Whitby's chief asset was its fine natural harbour on Lake Ontario, from which grain from the farmland to the north was first shipped in 1833. In the 1840s, a road was built from Whitby Harbour to Lake Simcoe and Georgian Bay, to bring trade and settlement through the harbour to and from the rich hinterland to the north. The Town of Whitby was chosen as the seat of government for the newly formed County of Ontario in 1852, and incorporated in 1855. The remainder of Whitby Township remained a separate municipality, although the eastern half surrounding Oshawa was incorporated as the new Township of East Whitby in 1857. In the 1870s, a railway, the "Port Whitby and Port Perry Railway", was constructed from Whitby harbour to Port Perry, and later extended to Lindsay as the "Whitby, Port Perry and Lindsay Railway". During the Second World War, Whitby was the location of Camp X, a secret spy training facility established by Sir William Stephenson, the "Man Called Intrepid". Although the buildings have since been demolished, a monument was unveiled on the site of Camp X in 1984 by Ontario's Lieutenant Governor John Black Aird. Following the War, Soviet dissenter Igor Gouzenko was taken to the facility with his wife to live in secretive protective custody after fleeing Ottawa, Ontario. In 1968, the Town of Whitby and Township of Whitby amalgamated to form the current municipality. Planning for the construction of a town hall intended to centralize municipal staff working in satellite offices began in 1970 under mayor Des Newman. Construction began on the Raymond Moriyama designed building in 1975; it was opened by Mayor Jim Gartshore on January 8, 1977. Whitby borders Ajax to the west, Pickering to the northwest, the Township of Scugog to the north, and Oshawa to the east. Since at least the mid 1990s, the development of subdivisions to accommodate population growth has proceeded in a mostly northward direction. Like much of Durham Region, demographics in Whitby are characterized mainly by rapid population growth. The 2006 census population of the town is 111,184 inhabitants, compared with the 2001 Statistics Canada total of 87,413. This represents population growth of over 27.2% in five years. The number of inhabitants has more than doubled since 1986, when Whitby had a census population of 45,819 people. According to the 2006 Census, approximately 17.0% of Whitby's population is classified as visible minority, with Black (6.1%), South Asian (3.3%) and Chinese (1.9%) populations forming the largest individual groups. 2011 Census data show that English is the mother tongue of 83.7% of the residents of Whitby, while native speakers of French make up 1.7% of the population. Of immigrant languages, only Italian is the mother tongue of more than 1% of the population (1.4%). The median household income in 2015 for Whitby was $103,809. Whitby is also home to the headquarters buildings of Durham Region and the Durham District School Board. Whitby is policed by the Durham Regional Police's Central West Division. There is also a detachment of the Ontario Provincial Police located in Town, mainly to patrol area provincial highways within Durham Region. Whitby Fire & Emergency Services provides firefighting services from five fire stations and ambulance/emergency medical services are provided by Durham Region EMS at the Whitby Paramedic Station (also as EMS Headquarters). Many residents commute to work in other Greater Toronto Area communities, and General Motors Canada in Oshawa is a major employer for all of Durham Region. Whitby itself is home to a steel mill operated by Gerdau Ameristeel, a retail support centre operated by Sobeys, and a major Liquor Control Board of Ontario warehouse. Other companies present in Whitby include pharmaceutical manufacturer Patheon, Lear Corporation, Automodular Assemblies, McGraw-Hill Ryerson, and several others. Public education in Whitby is provided via the Durham District School Board, which also has its headquarters in Whitby. There are twenty-four elementary schools and five secondary schools: Anderson Collegiate Vocational Institute, Brooklin High School, Donald A Wilson Secondary School, Henry Street High School and Sinclair Secondary School. The Durham Catholic District School Board oversees public Catholic education in Durham Region. There are twelve Catholic elementary schools and two secondary schools; Father Leo J. Austin Catholic Secondary School and All Saints Catholic Secondary School. Full French language education is provided by the Conseil scolaire catholique MonAvenir. There is one elementary school in Whitby, École élémentaire catholique Jean-Paul II (JK-grade 6), as well as a high-school, École secondaire catholique St-Charles Garnier (grades 7-12) which services all of Durham region. As noted above, Whitby is home to Trafalgar Castle School, an independent school for women that offers grades 5 through 12 in a university preparatory programme. Built in 1859 by the flamboyant Sheriff of Ontario County, Nelson Gilbert "Iron" Reynolds, Trafalgar Castle remains a unique Canadian treasure. The school had opened its doors in 1874 and was called "Ontario Ladies' College" until the late 70s, after which it changed its name to "Trafalgar Castle". There are also a number of Montessori schools offering programmes for early elementary grades. Although Whitby is one of the 100 largest cities/towns in Canada, it lacks a full-service hospital. The town was served by the Whitby General Hospital until 1998, when Durham hospitals were amalgamated by the Lakeridge Health Corporation, Under the amalgamated system, the hospital became Lakeridge Health Whitby and is a specialized health centre, with the closest full-service hospitals being Lakeridge Health Oshawa, Markham Stouffville Hospital in Markham and the Rouge Valley Health System, Ajax and Pickering campus in Ajax. The Ontario Shores Centre for Mental Health Sciences is located on the lakefront. It was originally called the Whitby Psychiatric Hospital, then Whitby Mental Health Centre. Ontario Highway 401 runs through the south end of Whitby, with interchanges at Brock Street and Thickson Road. Ontario Highway 407 was opened in Whitby in 2016. The toll highway passes between Brooklin and the urban portion of the town. Ontario Highway 412, connecting the 401 with the 407, also opened to traffic in the same year. Another toll highway, 412 is a north–south route located just east of the Whitby-Ajax boundary. The southern terminus of Highway 12 is also located in Whitby. It originally extended from Highway 401 northward as part of Brock Street, but this portion was downloaded to Durham Region in 1997. The southern terminus is now located just south of Brooklin at Highway 407. Finally, Highway 7 runs east–west between Brooklin and the City of Pickering. At Brooklin, the road changes to a north–south alignment and is multiplexed with Highway 12 to the northern boundary of the Town. Four railways pass through Whitby. The Toronto-Montreal corridor main lines of the Canadian National Railway and Canadian Pacific Railway both pass east–west through the south end of town. A second CP line running from Toronto to Havelock also passes through the northern part of Whitby. Via Rail trains travel through Whitby, but the nearest station is in Oshawa. Finally, GO Transit provides frequent service via its Lakeshore East line, which (in Whitby) runs parallel to the CN tracks. A GO Station is located in Town. Local transit services are provided by the region-wide Durham Region Transit. Prior to the Regional service, the Town provided its own service. GO Transit buses also connect Whitby with Durham Region (including Port Perry and Beaverton to the north) and areas further afield. Whitby Harbour, an important factor in the development of the Town, is now home to a 430-berth recreational marina. The closest international airport is Toronto Pearson International Airport, located 65 kilometres to the west in Mississauga. Whitby is served by the Whitby This Week newspaper, part of the Metroland Media Group. Several other papers have been published in the town over the years, including the Whitby Free Press, which ran from 1971 to 1996. Other GTA media outlets also serve the area. Whitby's most famous sporting team is the Whitby Dunlops, a celebrated ice hockey squad that captured the world championship in 1958 at Oslo, Norway. This team featured long-time president of the Boston Bruins, Harry Sinden and former mayor of Whitby, Bob Attersley. The Dunlops were revived in 2004 as part of the Eastern Ontario Senior Hockey League. The Whitby Yacht Club, which offers racing, cruising, social, and sail training programs on Whitby Harbour overlooking the Lake Ontario, was founded in 1966. Lacrosse is also a prominent sport in Whitby. The Brooklin Redmen Senior A lacrosse club is one of the most successful in Canadian sporting history, while the Junior A Whitby Warriors have been awarded the Minto Cup four times since 1984. Whitby is also home to the Iroquois Park Sports Centre, one of the largest minor sports centres in North America. The facility includes six icepads, a swimming pool named for local Olympian Anne Ottenbrite, six tennis courts, five ball diamonds, three batting cages, a skatepark, a soccer pitch, The Sports Garden Cafe restaurant and the Whitby Sports Hall of Fame. Whitby also developed the McKinney Sports complex which boasts three ice pads, two tennis courts and a skatepark, and Luther Vipond Arena in Brooklin, with one ice pad. These 3 sport complexes hold many sporting events. In 2008, the OJHL relocated a team to Whitby to play out of the Iroquois Complex, known as the Whitby Fury. Zack Greer, plays for the Denver Outlaws in the MLL and the Colorado Mammoth of the NLL. Jay Harrison, hockey player, currently an unrestricted free agent. ^ "Certified Results of Election" (PDF). Whitby.ca. Retrieved 2018-11-16. ^ a b "Série " Perspective géographique ", Recensement de 2011 – Subdivision de recensement, Whitby, T - Ontario" (in French). Statistique Canada. 2011. Retrieved 10 July 2013. ^ "Igor Gouzenko". Spartacus Educational. Retrieved 2017-01-17. ^ Ferencz, Sarah (27 January 2017). "Whitby town hall celebrates 40 years". www.durhamregion.com. Retrieved 27 January 2017. ^ a b Government of Canada, Statistics Canada (2017-02-08). "Census Profile, 2016 Census - Whitby, Town [Census subdivision], Ontario and Ontario [Province]". www12.statcan.gc.ca. Retrieved 2019-02-19. ^ a b "Community Profiles from the 2016 Census, Statistics Canada - Census Subdivision". 12.statcan.gc.ca. ^ a b "Aboriginal Peoples - Data table". 12.statcan.ca. ^ "Census Profile for Census Subdivision of Whitby (Town), Ontario". 12.statcan.ca. ^ "Certified Results of Election" (PDF). whitby.ca. October 22, 2018. Retrieved November 16, 2018. ^ "Certificate of Election Results - Regional Chair" (PDF). whitby.ca. Retrieved November 16, 2018. ^ "Home". Trafalgar Castle School. Retrieved 18 November 2018. ^ "Home". Whitby Yacht Club. Retrieved November 18, 2018. Ed McPherson 'The Whitby Yacht Club: 25 years in the making' Whitby, Ont. : Whitby Yacht Club, c1992. Wikimedia Commons has media related to Whitby, Ontario. 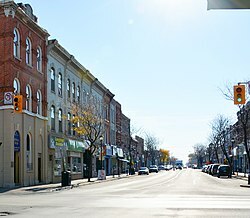 Wikivoyage has a travel guide for Whitby (Ontario).